-Tirupur the textile town popularly known as the Banian City or the Knit City is a centre for cotton market and cotton ginning factories. This bustling town visited by buyers from at least 35 countries is noted for its performance in technology and the quality of its macroeconomic environment. The hosiery town of Tirupur has the capacity to deliver any customized samples in less than12 hours and of course millions of pieces in few countable days. Nearly 56% of the total export from the country is from Tirupur which is quite praiseworthy and takes the credit of being declared by the Export Import Policy of 2002-07 as the 'Town of Export Excellence'. -Various factors are favorable to the town of Tirupur for being geographically located close to the centre of cotton spinning industry town namely , Coimbatore, the procurement of cotton as and when required becomes very easy for Tirupur. Also the strong enterprising energy and personalized management results organized controlling of people and operations causing cost effective competitiveness of the Industry and prompt delivery of quality products. The India Knit Fair Association formed in coordination of the Apparel Export Promotion Council (AEPC) and Tirupur Exporters' Association (TEA) organizes the India Knit Fair which is the biggest exhibition on Knit and Hosiery garments. -The first Indian knit fair was organized in 1995 and usually these fairs adopt the concept or themes based on seasons, namely, Spring/Summer and Autumn/Winter and depict the trends being followed in that particular season along with fashion shows. With a prominent existence in the global market, Tirupur is one of the largest foreign exchange earners of the nation earning Rs.5000 crores through 7000 units and providing ample employment opportunity to around 6 lakh people. 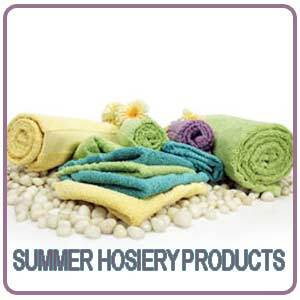 -The exact detail of the summer hosiery products of Tirupur though not clearly known but still it is believed to have started in 1985 with nearly an export of Rs.18crores to Rs.19 crores and soon by the end of 2007 it reached to an awesome number of about Rs.11,000crores. All the hosiery product of Tirupur which is a part of Textile and Clothing segment comes under the system of Quantitative Restrictions (QR) where country was permitted to import or export form another country only to a particular limit specified by the QR. Thus Tirupur which is a major exporter of all knitwear�s and hosiery products to the markets across the globe was confident of its export assignment and soon prospered under this system of proposal. -But with the notable arrival of WTO in 1995 along with lot of favorable circumstances there were also threats to the hosiery industries of Tirupur when the ATC proclaimed to phase out the QR from the beginning of 2005. Thus the Tirupur hosiery exporters had to look out for innovations in all that they did so as to compete with the latest authority. But once the quota system was pulled apart, the hosiery industry witnessed mixed vogue for the figure of export hiked from Rs.6500 crores in 2004-05 toRs.8000 crores in 2005-06 .But however soon there was signs of dwindle where there was a downward jump in 2006-2007 from 11000 crores to 9,950 crores in 2007-08. The main reason behind this downward trend was because of extreme competition and appreciation in rupee value. -There were also other external factors which influenced this downfall like acute power shortage, labour shortage, high transportation costs and environmental issues to a great extent. This further led to a diminish of about 10-15 % for nearly three years from 2009-10 to 2011-12.There were several case studies and model experiments done on this by great economists like Porter and Ricardo. The latest technological enhancements are also a reason behind the current pattern of trade among the different countries. The four main key factors which attribute to the changing pattern of trade among the nations are Nation, Government, Industry and individual firm and the hosiery industry of Tirupur very much falls under this category of paradigm shift. -As explained earlier before the removal of quota there was not much competition in the hosiery industries for during that period the global market was dominated by the quota system and there were no threat for there was always a confirmed market for the Tirupur hosiery products. But still even under the quota system the opportunities were limited based the countries cannot export more than the prescribed figure according to the quota. Tirupur located in a favorable geographical location aided with the best climatic conditions for cotton farming and thereby acquirement of cotton yarns as per requirement. The labour cost was also much cheap during the initial period resulting in a less cost of production. -Thus the in the last decade the hosiery products of Tirupur witnessed a lucrative business which is not the same with the present day situations. The government provided with a lot of benefits and protection for the hosiery units of Tirupur which emerged as a small scale industry. The social network among the industries was also strong which favored exchange of essential informations. Slowly there was lot of fragmentation in the industries which resulted in outsourcing to handle large orders. There were latest machineries imported into the hosiery market which was highly modernized. In that period most of the hosiery units in Tirupur remained as a small firm which was a big advantage where there was better managerial control and supervision thereby resulted in a better quality and production and also prompt dispatch. All the above mentioned situations persisted in the hosiery industries of Tirupur till the removal of the Quota system. -There was great difference in the business environment of the hosiery market of Tirupur once the quota system was totally removed. The scenario of the hosiery product of Tirupur became very competitive in the global market for there were other countries like China and Bangladesh to compete with. There was an equal opportunity for both growth and threats. The profits were also getting squeezed due to competition from other countries. The factors which proved to be as a strength to this industry before globalization became a de-merit after globalization for counties like China were able to supply to the market a knitted fabric with cheap cotton and less labor with modernization of technology which was a plus to China and minus to Tirupur. -The WTO came up with rules discouraging the government to stop enhancing their exports through preferential allowances and subsidies which led to industries to be funded by themselves. All these and many more has led to the hosiery industries to gain great competitive strength for if they are competitive they can be easily washed away in the global market with enormous competition. 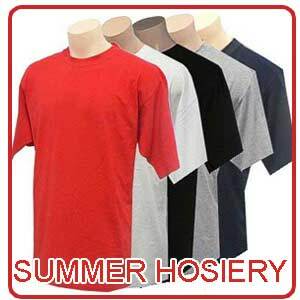 If at all the hosiery industry of Tirupur and the government has to withstand the heavy competition in the global market then it has to devise new strategies and prepare methodical action plans. 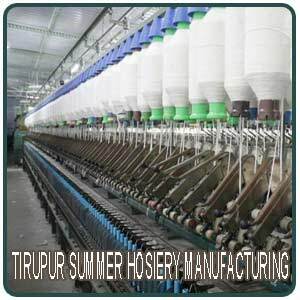 The development of the Tirupur hosiery industries has to be taken care with special attention by bringing new enhancements in its related field. -The infrastructure of Tirupur has to be looked upon effectively by investing and developing projects on infrastructures based on the Public Private Partnership (PPP) mode. When it comes to production it should be made sure that the entire steps involved is carried out under the same roof than being split in different places for this will result in increased production cost and of course with loss of time and poor consistency in the quality of the end product. The hosiery industries and the government should take steps in conducting training programs for workers of all levels. Recent research analysis has shown that the productivity of Indian worker is the lowest in the world. -There should be standard norms set for the workers both on health and good working environment especially emphasis should be made on sanitary measures and thereby regulating the working conditions. Now environmental issues are becoming a big concern both for the people, WTO and WHO. The government is taking steps to set a huge effluent treatment plant to discard out the waste from bleaching and dyeing units. The hosiery units in Tirupur and the government are jointly planning to set up R&D departments with testing laboratories. High level committee should be set up for the upcoming of the hosiery industries and also to study the needs of this unit in particular. -The Tirupur Exporters Association though maintains statistical data on the hosiery units more accurate data�s has to be maintained also by the government. The Hosiery units should be well exposed to the provisions and the impact of WTO in order to give improved performance. Slowly many fashion institutes like National Institute of Design (NID), National Institute of Fashion Design, and School of Fashion Technology are coming up to assist the hosiery industries in coming up with latest trendy designs. Tirupur has to also start focusing on winter hosiery products for other major market is targeted on Western countries which experiences short summer and long winter. Focusing on the winter hosiery products will be an improved strategy in the growth of the Tirupur hosiery products. The hosiery industry can also diversify into other related products like home textiles and technical textiles.